Asbestos was banned from use within construction in the UK after a law was passed in 1999. Any building or structure built since then has not been able to use the potentially dangerous material, but for a vast quantity of buildings throughout the country asbestos is present due to the time that construction took place. It was a widely popular material used in construction throughout the majority of the 20th century. With this in mind, if asbestos is discovered in a building it is important to understand the choices open to you, and what the best approach is to either manage or safely remove asbestos with the safety of inhabitants or workers, who use the building every day, in mind. If you are exposed to asbestos fibres it can cause long-lasting damage and potentially life-threatening illnesses. 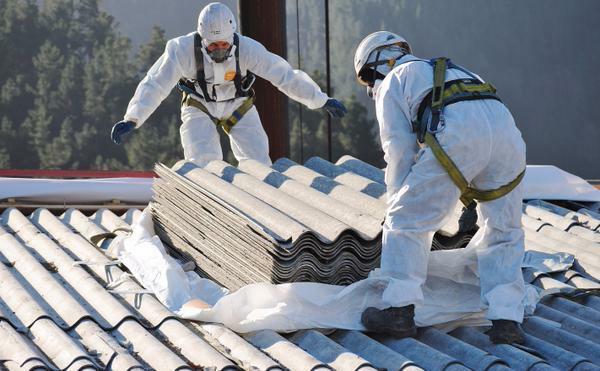 Asbestos-related diseases such as mesothelioma are common amongst workers from industries where asbestos was present, but in the vast majority of cases the symptoms of mesothelioma do not begin to present for many decades later, by which time it is too late. Even moving asbestos a short distance can release the potentially deadly fibres into the air. It only takes one single breath and inhalation of asbestos fibres for health-problems to begin. There are many different types of situations where asbestos might be discovered. It is present in so many residential buildings, schools, hospitals, and other public buildings, and as refurbishment, renovation, or demolition takes place now, it is important that a full and thorough asbestos survey is undertaken prior to any work beginning. You should never risk moving asbestos or any materials you suspect to have asbestos in it, on your own. DIY removal of asbestos is extremely dangerous, not only to the person moving the materials, but also to anyone in the immediate vicinity. There have been many cases over the years where people have found asbestos in domestic properties, or whilst working on commercial construction and renovation projects and decided to move asbestos and asbestos materials without the assistance of licensed operators. Asbestos has been found dumped or buried, which is a criminal act, as this could endanger the lives of anyone who ends up coming in to contact with it at a later date. You have some options in terms of asbestos discovered at a property, but they should always include the assistance of professional asbestos surveyors and management consultants, fully licensed to handle asbestos. After a full asbestos survey you’ll be informed of the safest approach moving forward. In some cases this could be an encapsulation process, where a protective adhesive is applied to all asbestos materials present. This will prevent the release of asbestos fibres in future and protect those living and working within the building. In most cases, especially where renovation, refurbishment or demolition work is to be undertaken, full removal will be put forward as the best option. A fully licensed asbestos removal team will enter the building and remove the threat completely, safely and securely. After this has been completed, re-boarding is an option, covering up the areas where asbestos was once present (this is only applicable where a building is to remain in place).